Having distributed such poor Christmas gifts as I had to those around me, I have been looking for something for you. Trifles even are hard to get these war times, and you must not therefore expect more. I have sent you what I thought most useful in your separation from me and hope it will be of some service. Though stigmatized as “vile dross”, it has never been a drug with me. That you may never want for it, restrict your wants to your necessities. Yet how little will it purchase! But see how God provides for our pleasure in every way. To compensate for such “trash,” I send you some sweet violets that I gathered for you this morning while covered with dense white frost, whose crystals glittered in the bright sun like diamonds, and formed a brooch of rare beauty and sweetness which could not be fabricated by the expenditure of a world of money. May God guard and preserve you for me, my dear daughter! Among the calamities of war, the hardest to bear, perhaps, is the separations of families and friends. Yet all must be endured to accomplish our independence and maintain our self-government. In my absences from you I have thought of you very often and regretted I could do nothing for your comfort. Your old home, if not destroyed by our enemies, has been so desecrated that I cannot bear to think of it. I should have preferred it to have been wiped from the earth, its beautiful hill sunk, and its sacred trees buried rather than to have been degraded by the presence of those who revel in the ill they do for their own selfish purposes. I pray for a better spirit and that the hearts of our enemies may be changed. In your homeless condition I hope you make yourself contented and useful. Occupy yourself in aiding those more helpless than yourself. Think always of your father. The Lee family had lost their ancestral home, Arlington. It was technically the Custis family home and Mrs. Lee was a Custis. However, Robert E. Lee had cared for and regarded Arlington as his home, spending as much as he could there on military leaves. After Robert E. Lee resigned from the U. S. Army (April 1861), Arlington was threatened and eventually Mrs. Lee and her daughters left, taking with them a few of the family treasures, but leaving most (including most of George Washington’s possessions) behind. While the Lee boys joined the Confederate military, the ladies searched for a safe place to live, relying on the kindness of friends. They would eventually spend most of the war years in Richmond, Virginia – capital of the Confederacy. Christmas holidays in the mid-19th Century weren’t as materialistic and full of extravagant gifting as some modern traditions. However, it was customary to exchange pretty and useful gifts among family. The gift General Lee wanted to send his daughter was a pretty broach – a useful, decorative pin, usually used to fasten collars. However, he sends her cash, feeling that is a poor gift and not what he would like to give her. He also – with kind thoughtfulness – sends violets. I assume he really sent the flowers and that must have been a lovely surprise. 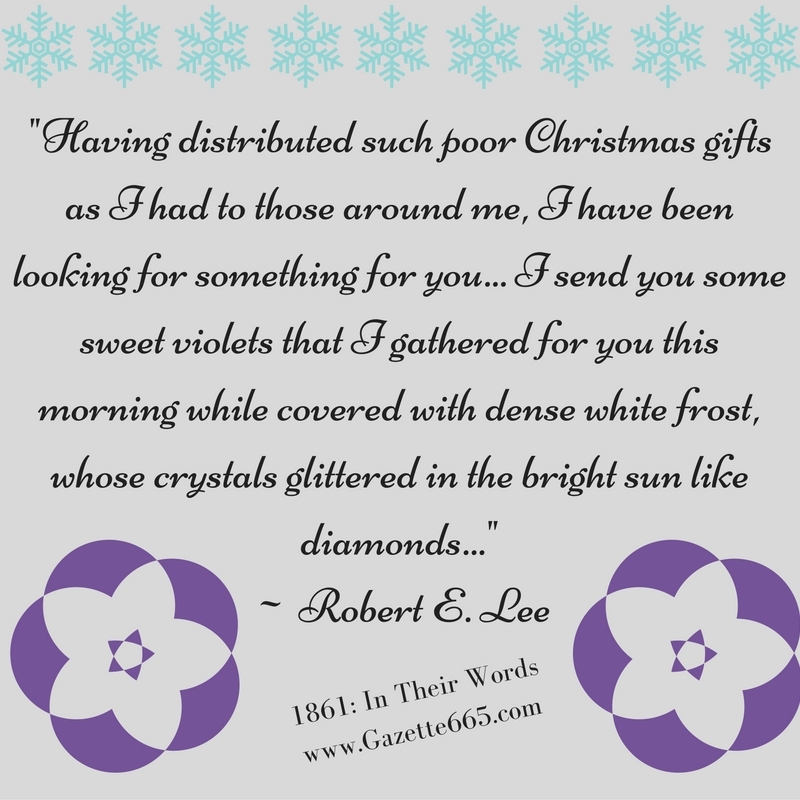 General Lee begins his letter, telling that he has been sharing Christmas gifts with those around him – probably military officers and maybe a few hospitable civilians. At the end of his note, he encourages his daughter to help those around her. A girl driven from her home – and her father still encouraged her to serve those around her and not dwell in self-pity! Perhaps the father felt that was one of the best gifts he could give his children – instruction to be encouragers. He tells his daughter to “think always of your father”, probably just in the “remember me, pray for me” idea. But to a modern reader, it seems like he might be unknowingly saying “follow my example.” The general gave Christmas gifts and joy to those around him; he urges his daughter to do the same to those near to her. Hi, Sarah. That is a very nice letter! Hi, Sarah. That happens sometimes, so we work with what we have.